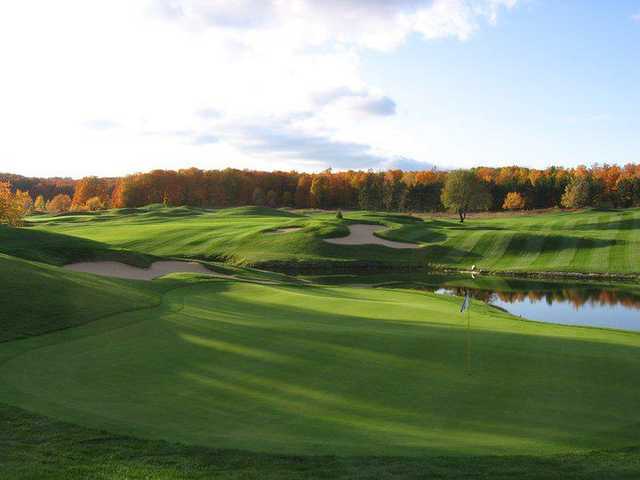 The 18-hole Black Bear Golf Club in Vanderbilt, MI is a resort golf course that opened in 1996. 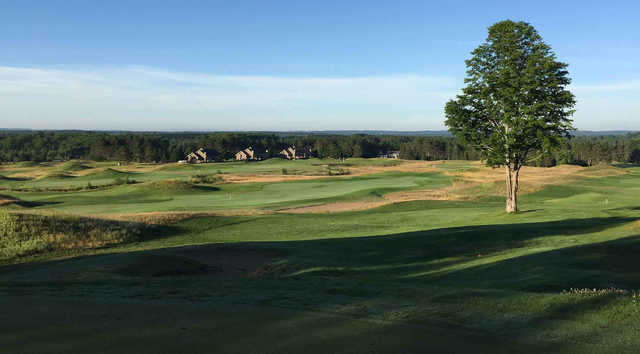 Designed by Mark Sauger, Black Bear Golf Club measures 6425 yards from the longest tees and has a slope rating of 144 and a 71.8 USGA rating. The course features 4 sets of tees for different skill levels. Nice layout but save your money. They are having financial issues or in transition. Bunkers have not been touched all year. Greens are slow. And fairways and tees are barely sprayed....if at all. Where to begin ? The so called general manage needs a lesson in customer service absolute worst I have ever been treated at any business. Lots of grass clippings on course which is strange because grass or atleast living grass is hard to come by. Sand traps are gravel we would actually take a no penalty drop out of them so we wouldn't damage our irons. Had to drive up and put the flag in the cup on 4 separate occasions. Tee boxes are a mess and layout is poor very jumbled. Believe it or not the GM actually went down to the pump house and turned the sprinklers on and had his crew go around and turn the heads on for every hole ahead of us on the back nine and we finished they immediately turned them off. Course is a joke plenty of better options in the area. Don't waste your time or hard earned cash. The lady who I spoke to was very nice nothing bad to say about her but the male "GM" is totally unprofessional. Played on 4/19/16. There were no distance markers out and the greens were loaded with pine needles, cones, small sticks...etc. When I mentioned it to the manager, he became sarcastic and verbally abusive suggesting that I should "submit a resume" if I thought I could do better, and to download the course to my phone if I wanted yardages. With all of the great courses in and around Gaylord, I strongly suggest you skip this one. Horrible attitude for a manager. Good course. Played 18 on Saturday 6/13/15. $35 for 18 w/ cart for an early AM tee time. This really is the best value you will find in the Gaylord area. Most other courses are $70+ for peak season. The greens and fairways were in good shape. Very friendly staff. My only complaint would be the sand traps. Many looked like they had not been raked yet this season and had small/medium sized rocks in them. If this was improved I would have rated the course "very good". Overall, I will be coming back to Black Bear. I love playing this course. Challenging greens, plenty of opportunities to make shoots and it is the best value in northern MI Golf. I try to play it ever year. I played here in 2013, and I will be skipping it in 2014. The grass, from tee to green, was brown, to the point that differentiating what was fairway and what was rough became difficult. 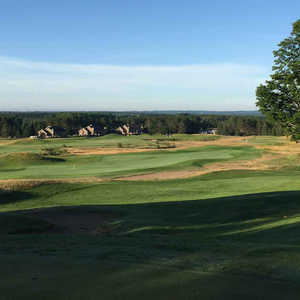 The greens were an abomination: too fast for the amount of undulation in them and hard as rocks; my lasting impression of this course was the horror I felt watching a well-struck 20 yard pitch roll over a hill, 30 yards past the green. If you are going to Gaylord, skip it. Nice layout, enjoyable course. I'll admit, I played it a few years ago in June and it was in good shape then - might've benefited from favorable weather then. Reviews now suggest the course has gone down hill since then, not sure why that is so, I remember it being in great shape, tee to green. Some of the issues I've read are inexcusable, so it comes down to management and probably to a similar degree, financial reasons. If they sort out management issues, and figure out how to make a budget work to make on course conditions better, sounds like it could be really nice again. Because of my experience a few years ago, I'd play it again, I enjoyed it. But if the conditions are as poor as some have described, it'll be a few notches lower on my list of courses to play in the Gaylord area. Overall, I say play it and see, the greens fees are usually pretty reasonable. It was a great course when it opened, very hard and in the best of shape. Junk now. Tee boxes and fairways In poor shape, greens in good condition. Service by General Manager was extremely poor. We called and made a 11:00 AM tee time only to drive a half hour to find out the course had a scramble event that started at 10:00. We were not told about this on the phone nor were the other dissatisfied groups that were out on the course waiting on every hole! At the turn we tried to discuss the situation with the GM (Ian), he could have given us rain checks for the remaining 9 holes - instead he decided to be an obstinate idiot telling is it is normal for three foursomes to be stacked up at every tee box. I wouldn't waste my time on this course. The fairways and greens were in terrible condition. Knew we were in trouble when we went to the practice range and saw it hadn't been mowed in weeks. With proper maintenance this course could be special but when I was there on 7-15-13 everything was run down and neglected. Reasons to come to black bear golf club. - 6 and a half hour round. - calling in to tell that the pace of play is slow. - being done with 16 holes and haveing the people come out to tell you that you are playing way to slow. - waitin 15 mintutes every tee shot. 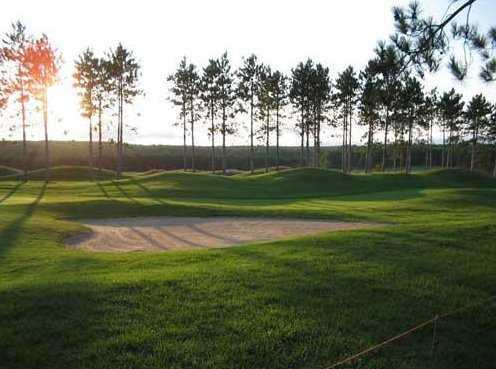 Black Bear is a very good course that has reasonable prices for greens fees. The course has some room to hit off the tee but has several areas of trouble. There are very few flat lies, and the course is not rediculously long but makes up for it at the greens. very good course design and is very difficult for even a low handicapper. Has a Scottish links flavor to it with a lot of sand traps and only a few blind shots. The only negative is the greens are too fast with a lot of undulation that makes putting very difficult. Also, every green is fenced off which makes for a lot of walking up and down hills getting to your ball which can make for slower play. 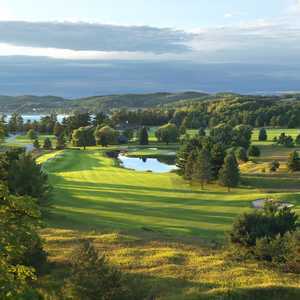 Overall - an excellent golf course to play and enjoy.